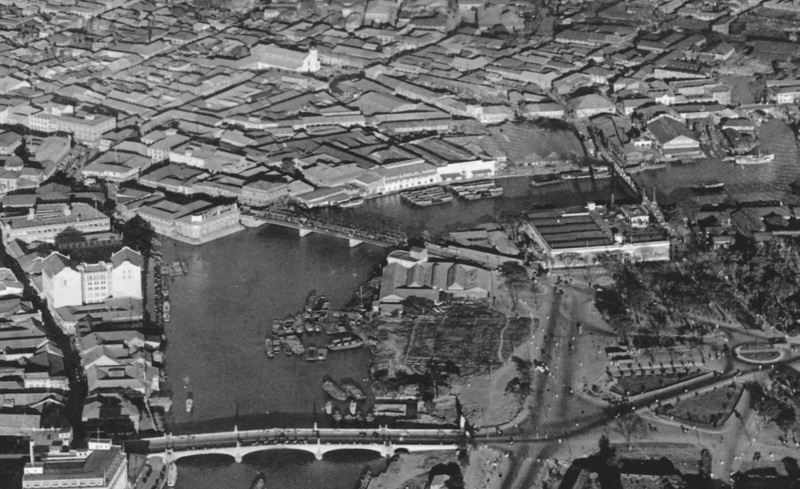 Pasig River, Jan. 15, 1925. The bridges that connect modern Manila and old Manila, the Jones Bridge, Sta. Cruz Bridge (later, the MacArthur Bridge) and the Puente de Colgante (later, the Quezon Bridge). In this picture, you can also see the Quiapo Church at the top, a glimpse of the Sta. Cruz Church on the right, the Insular Ice Plant in the middle of the Sta. Cruz Bridge and the Puente Colgante. The foundations of the Post Office Building were still being laid out and the Metropolitan Theater was still nonexistent. Another noteworthy bridge that crosses the Pasig is the Puente de Ayala, a few meters upriver from the Puente de Colgante. Join me as I take you on a journey through time and let me help you remember and appreciate what the Philippines was and what it has become.